The paradise island of Gran Canaria is located in the Atlantic Ocean, 130 miles from the African coast. It is the third largest of the Canary Islands and has Fuerteventura and Gran Canaria as it neighbours. Golf and water sports are also popular and the resorts offer some of the best cafes, restaurants, clubs and nightlife in Europe. Access around the main resorts is generally very good. There has been recent investment in extensive promenade development along the coast in the south, which is now complete and is easily accessible for wheelchair and mobility scooter users. Most resorts also offer a wide range of children's activities. Gran Canaria first earned its popularity with tourists as a health resort and still today the island's spas, mineral-rich waters and ideal climate maintain its image as a place to refresh mind, body and soul. The capital Las Palmas, situated in the north east of the island, offers a wealth of attractions, including fabulous fiestas and street processions. The south of the island includes delights such as the picturesque village of Puerto de Mogan (known as Little Venice), and the beautiful area around Playa del Ingles. The glorious weather in Gran Canaria makes it the perfect holiday destination 365 days of the year. The Canary Islands boasts a subtropical climate, which makes them an appealing holiday destination at any time. In December and January you still can enjoy magnificent weather, days on the beach, a swim in the ocean and lovely blue skies. Compared to many other European destinations, Gran Canaria winters are extremely mild, one of the factors that makes it a very alluring destination for holidaymakers keen to escape the colder climates of home. May, June and July are good months to travel, with the weather really getting hotter. A lovely cool sea breeze makes even very hot summer days refreshing. 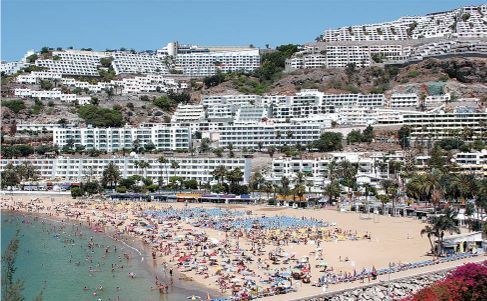 So if this has got you in the mood for a bit of sunshine, feel free to call us on 0800 622 6000 to speak to one of our experienced travel consultants about the best time to for a wheelchair accessible holiday in Gran Canaria. On the southern tip of Gran Canaria, Maspalomas is a quieter, more sophisticated version of its neighbour, Playa del Ingles. Instead of big shopping centres and starry-eyed nightclubs, it serves up first-class restaurants and designer boutiques, all next to a standout strip of beach. The Blue Flag beach at Maspalomas is 6 kilometres long, and 100 metres wide in places. It has a great choice of watersports and there are seafront cafés, bars and restaurants in walking distance. Best of all, the whole scene is backdropped by wave upon wave of Saharan-sized dunes, 400 hectares in total, criss-crossed by camels. 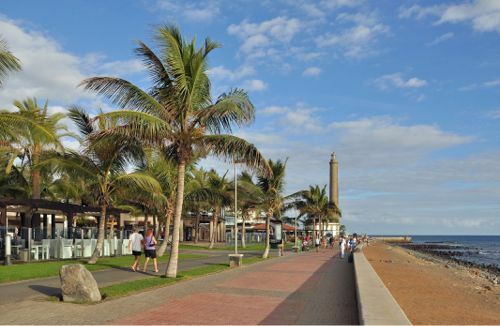 Maspalomas is classed as a more up market resort and has become a favorite destination for families with children, especially because the pace is relaxed and yet there are plenty of activities for both adults and children. For starters there’s Aqualand with its cast of friendly sea lions. There’s also Sioux City, a Wild West theme park built on the site of a film set. Both are just 10 minutes away. A great resort for a disabled friendly holiday. Summer daytime temperatures normally range from the mid-twenties to the mid-thirties, and such warmth is generally joined by a cooling sea breeze. The island is only a few degrees lower in winter, meaning that it is also a great place to escape to during those frosty December and January UK months. Airport Transfer time is 40 mins. Call 0800 622 6000 todays to speak to one of our experienced travel consultants about a disabled friendly holiday in Maspalomas. This is a new high quality developed area and is really an expansion of Maspalomas along the coast in the direction of Puerto Rico. Running north-west from the lighthouse, this resort has recently been given a major facelift and wow it’s impressive! Everything about this place has an air of luxury about it. It’s attractive, trendy, affluent and above all stylish, without being over the top. Crammed with designer shops, jewellers and high-end boutiques it’s a haven for retail therapy, not to mention fine-dining. 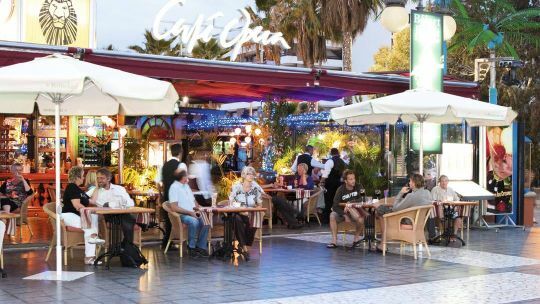 There are shopping centres, restaurants, cafés and bars running along the promenade offering cuisine from all over the world. The choice of international dishes and where to sit and enjoy a beautiful sunset are endless. All set on a beautiful promenade making it perfect for disabled friendly holidays. Most of Meloneras seafront shore line is rocky with a very low cliff with the sea front paved walkway on the top. This path is backed by high quality hotels. There is a small bay with a beach backed by a shopping centre. The wonderfully long stretch of beach at Meloneras is typically quiet, even on Sundays when local families spend the day enjoying the sand, sea and a hearty barbecue. The sand consists of coarse powder leading down to a pebbly shoreline. Neighbouring Maspalomas also has a magnificent beach, backed by undulating dunes and washed by azure waters. Call 0800 622 6000 todays to speak to one of our experienced travel consultants about a disabled friendly holiday in Meloneras. 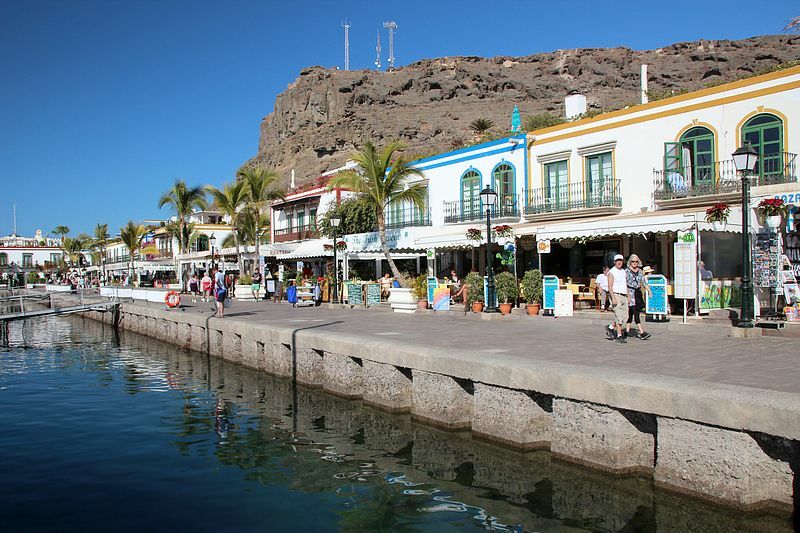 Disabled holidays to Puerto Mogan take you to one of Gran Canaria’s prettiest towns. Its narrow, cobbled streets are lined with traditional whitewashed houses, clad in bougainvillea and hibiscus. 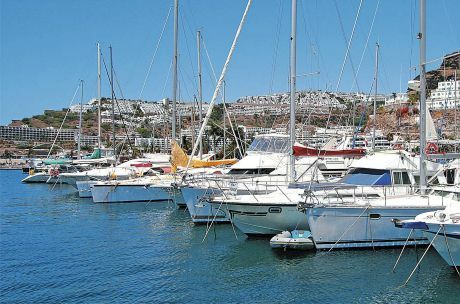 The attractive yacht marina with its neat and tidy restaurants, stylish cafés, jazz and piano bars surrounding the local fishing fleet, which is still operating, is the perfect location for an evening walk and, what’s more, a romantic sunset dinner. 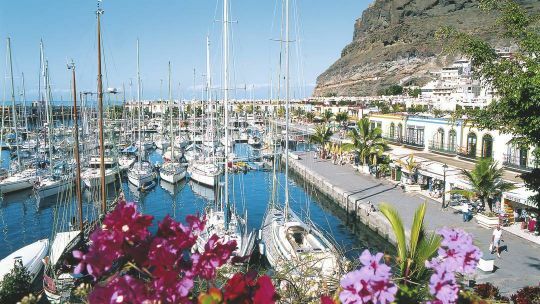 Puerto de Mogán also boasts a network of pretty sea-water channels - from which this port earns its ‘Little Venice’ nickname - linking with promenades and small bridges, making a stroll around this port very relaxing. The traffic-free centre help create a disabled friendly holiday in Gran Canaria. Puerto de Mogán represents an ideal day out too, especially on a Friday morning when a huge and attractive market occupies the fishermen’s quay. Puerto Mogan’s showpiece is its wide, sandy bay, which is nicely sheltered by the surrounding cliffs. It lays on plenty of loungers and umbrellas for hire, and you’ll find a great spread of waterfront bars and restaurants along the prom. Call 0800 622 6000 todays to speak to one of our experienced travel consultants about a disabled friendly holiday in Mogan. Sitting on Gran Canaria’s brow, Las Palmas is a fitting capital for such a beach-blanketed isle. Two good-looking swathes of sand unravel for around four kilometres. It’s not all about the coast, though. You’ll also find chic boutiques, bazaar-like streets and elegant squares to boot. It’s easy to substitute sightseeing for sunbathing in Las Palmas. The city comes with a double helping of picturesque bays. Playa de las Canteras, in particular, is rated as one of the best urban beaches in Europe. It’s worth taking some time to explore Las Palmas’ pretty old quarter, Vegueta. 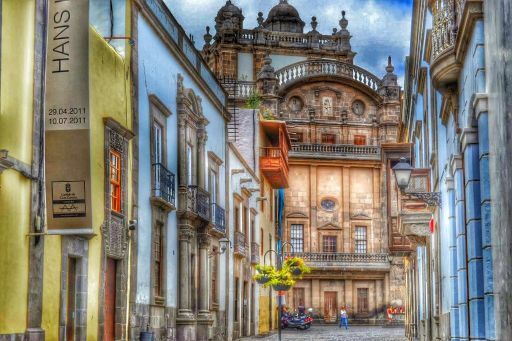 Here, you can climb up Santa Ana cathedral, stroll past handsome monuments and check out the Christopher Columbus museum, where the great explorer is said to have stayed. Meanwhile, 20 minutes’ drive out of the city gets you to the Caldera de Bandama - a huge, 2,000-year-old volcanic crater. A disabled friendly holiday in Gran Cranaria with a bit of culture thrown in. Call 0800 622 6000 todays to speak to one of our experienced travel consultants about a disabled friendly holiday in Las Palmas. 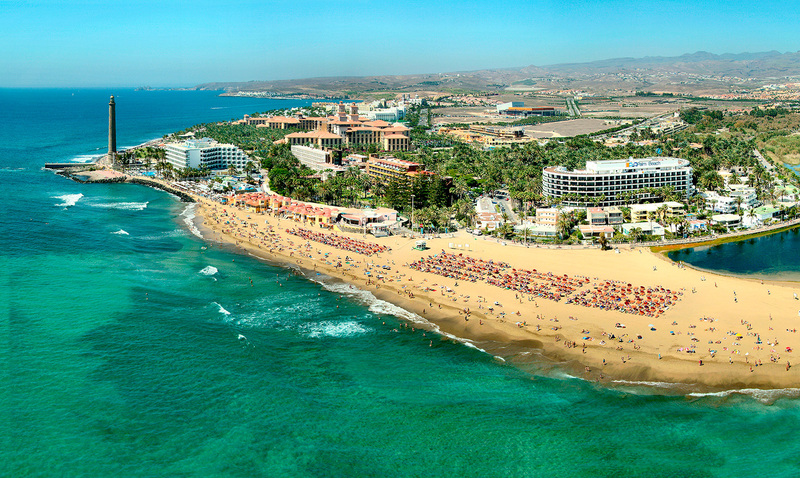 Playa del Ingles is set on the southernmost tip of Gran Canaria. 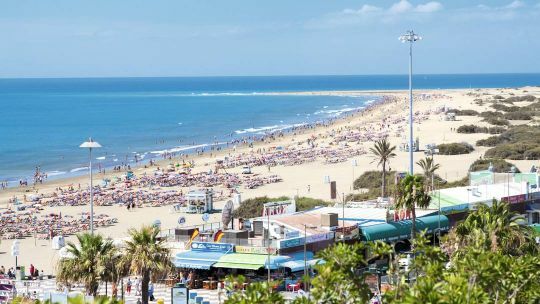 Sandwiched between the smaller resorts of Maspalomas and San Agustin, it’s brimming with purpose-built apartment complexes and hotels, big-name nightclubs, and a Saharan-sized beach. Playa del Ingles is know for it's beach and nightlife; it offers plenty of sun and fun, shopping malls and fast food restaurants. The resort was created in the 1960's and over time has become one of the more famous resorts throughout Europe. If you are going on holiday to take in come cultural sites this is not the place for you! Through the day you will find just about everyone at the beach or shopping and once nightfall comes, discos and nightclubs jump into action until the early hours of the morning. Playa del Ingles is home to many bars and restaurants from around the world including English, German, Dutch and Scandinavian. 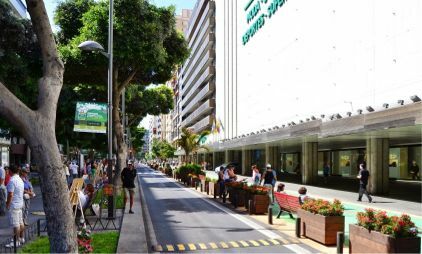 Should you get bored of the beach there is an attractive pedestrian promenade called the Paseo Costa Canaria. Along this promenade you will find luxurious villas. Looking for holidays for the disabled in Lanzarote with a bit if pizzazz? Then Playa del Ingles is the place to be! Airport Transfer time is 30 mins. Call 0800 622 6000 todays to speak to one of our experienced travel consultants about a disabled friendly holiday in Playa del Ingles. Puerto Rico is situated at the mouth of a large valley. Once a small fishing port, Puerto Rico today has many hotels and apartments. It has a beautiful, small beach, covered with sand which has came from the Sahara. Set back from the beach, in a tropical garden, there are two public swimming pools. Puerto Rico is well known for water sports activities which include jet-skiing, sailing, diving, big game fishing and windsurfing. Wheelchair holidays in Puerto Rico provide lots to watch from the beach. How relaxing! If you are not interested in these things you can enjoy pleasure boat trips, dolphin watching or a trip in a glass bottom boat. Other attractions in Puerto Rico include golf courses, a water park and an attractive shopping centre which is located close by. Puerto Rico also has a nice harbour and it is renowned as a sailing centre. Deep-sea fishing is at its greatest here with more than fifty world records claimed by fishermen setting out from this port. Call 0800 622 6000 todays to speak to one of our experienced travel consultants about a disabled friendly holiday in Puerto Rico.